When air training with the Harvard ended, there was uncertainty over the future of the base. Even though the City of Red Deer wanted the airport, there was plenty of local support to keep the base open and enjoy the economic benefits of federal government spending. On the other hand, the provincial government was willing to buy up all surplus buildings to create an industrial park. Instead, the base became a parent to a number of lodger units, not all of them from within DND. Even without flying training there were 43 Radar Squadron and the Regional Emergency Headquarters, 743 Communications Squadron, which supported the emergency headquarters, and, on a seasonal basis, the Hail Research Group. In 1965 the Refrigeration Maintenance School moved in temporarily, and was expected to produce 18 technicians every four weeks. The Refrigeration Maintenance School departed for CFB Chilliwack, B.C., in the summer of 1967, but as late as 1971 Penhold still gave local refrigeration maintenance technicians' courses. The base filled empty space by accepting the Royal Canadian Mounted Police (RCMP) Training School in 1966. The RCMP trained on base until 1974, when DND told them, as well as Alberta Hail Studies and the local Soaring Club, that the base could no longer support them because of other commitments. Nevertheless, RCMP and other police forces continued to give courses on base throughout the 1980s. Throughout this period CFB Penhold continued to host regional Royal Canadian Air Cadet summer camps. These had been held at the station ever since the days of No. 36 S.F.T.S. during the Second World War. These were joined in the 1960s by the national scholarship flying programme on gliders and light aircraft. The flying programme was held on the airport for a number of years. During these camps the personnel strength on base swelled from 470 to about 1,400. The new commitment on base in 1974 was the Canadian Forces Junior Leader School. Intended to train soldiers in junior non-commissioned officers' duties, the first course began on 11 March 1974 and in the fist year the School produced 538 graduates in five courses. In spite of these new tasks, CFB Penhold was still the smallest base in the Canadian Forces. An excellent review of its tasks, commitments and facilities at the height of its post-unification activities in the early 1980s is found in the document 'Welcome to Canadian Forces Base Penhold'. One of the last reasons for maintaining the base disappeared on 1 January 1986 when 43 Radar Squadron switched off its sets from the Pinetree Line. To mark its contribution for more than 20 years, the radar heightfinder was mounted adjacent to the Harvard at Penhold's main gate. The base did take on a last commitment. The Air Reserve National Training School, which had been held at Penhold for several years, became a permanent lodger unit as the Air Reserve Training Centre in 1991. The unit was housed in 28 4x18-metre modular units placed on hard foundations. The unit did not undertake any air training at Penhold. In 1991 the base downsized considerably as part of the first of the reductions to DND and the Canadian Forces of the last decade. 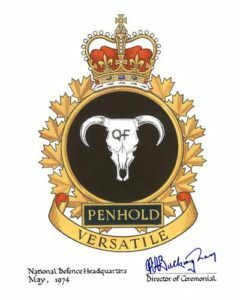 Then, CFB Penhold officially disbanded 31 May 1992. The installation struggled on for a further three years as Detachment Penhold of CFB Edmonton., but on 15 September 1995 the last military personnel left after an occupation of 55 years. Immediately before the signing of the lease for the new airport, Hangar no. 1 was occupied by the City for airport purposes. No. 2 was the Air Cadet summer camp glider storage, workshop and administration offices. No.3 was the cadet barracks and barrack storage. No. 4 had recently been taken into use as an RCMP garage and driver training centre. No. 6 housed the base Construction Engineering Section. In no. 7 was vehicle storage, offices and a maintenance area. Hangar no. 5, burned in 1954, was never replaced. Hangars nos. 1, 2 and 3 were transferred to the City in 1971. The VHF/ADF installation, and the land upon which it sat, were declared surplus in 1973. In November 1979 the gas regulating station at the heavy radar site exploded and burned with some $20,000 damage to each of Canadian Western Natural Gas Company's equipment and DND property. The next year a PMQ at 222 Pine Street burned with $25,000 damage. A 1991 fire completely destroyed the patio at the Sergeants' Mess. In 1985 base Construction Engineering, recognizing that after twenty years the base would not be doing any more flying training, closed in the hangar doors of Hangars nos. 4 and 6. The base Transportation Section occupied Hangar no. 4 in 1987. Construction Engineering removed asbestos from the Base Theatre in 1988. .DND land which comprised CFB Penhold was divided into five parcels: three agricultural; one containing the former Provincial Bunker; one with the main base infrastructure; and, the one containing the MQs, the former DND School, Curling Club and Recreation Centre. In April, 1995, the new owners were announced for all but the main base area and the married quarters parcel. These remaining two parcels are awaiting TB [Treasury Board] approval of the two highest bids selected by Public Works Canada. The bunker site, which was decommissioned in 1994, was sold to two businessmen for $312,000. In 1997, after the two had been approached by the Hell's Angels, a car-smuggling ring and a Caribbean-based survivalist group who believed the world would be engulfed in flames in 2000, the federal government re-purchased the bunker, along with a smaller on in Innisfail, for $1.25 million rather than have it fall into the wrong hands. The utility services of CFB Penhold remained integrated with those of Red Deer Industrial Airport. The central heating plant was on the base, but produced steam to heat the hangar line. The pumphouse and reservoir were on the airport, but drew from wells on the base. The sewage plant on the base served both facilities, while the base dumped garbage on the airport disposal site. The replacement of water mains on the airport came from the initiative from a DND engineering study and by far the greater part of the mains were in the base and PMQ areas. Replacement cost DND $796,000. Base Construction Engineering drilled new wells in 1986-1987. The old sewage plant was nearly lethal in May 1976. Two workers were fixing a pipe in a dry well five metres deep, when a valve failed, filling the well with sewage reaching nearly to one man's neck and with sewer gas which overcame both of them and a rescuer. The three were hospitalized. It is not known if the sewage spill contaminated ground beyond the plant. In 1984 the base and the airport were joined to the Waskasoo Regional Sewer system. DND's share of the cost was $934,000. Base Construction Engineering demolished the old sewage plant in 1988.